I have visited Thailand 9 times by now. I am quite at home in the country. 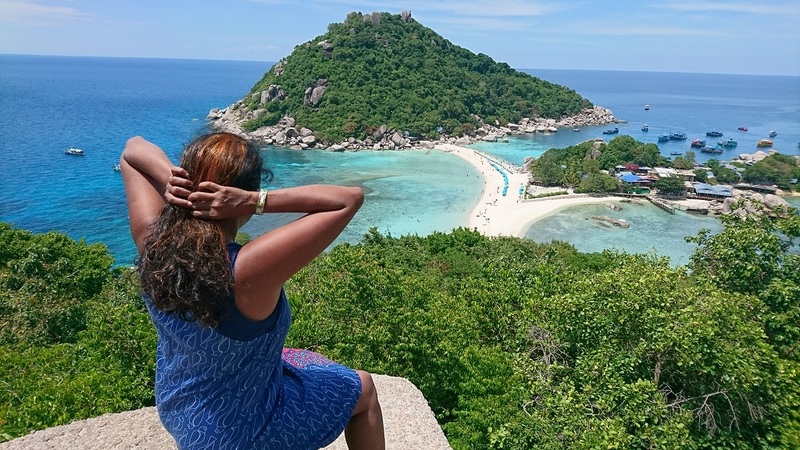 I went back to Thailand in September 2017 with Getaway Goddess to Koh Samui. 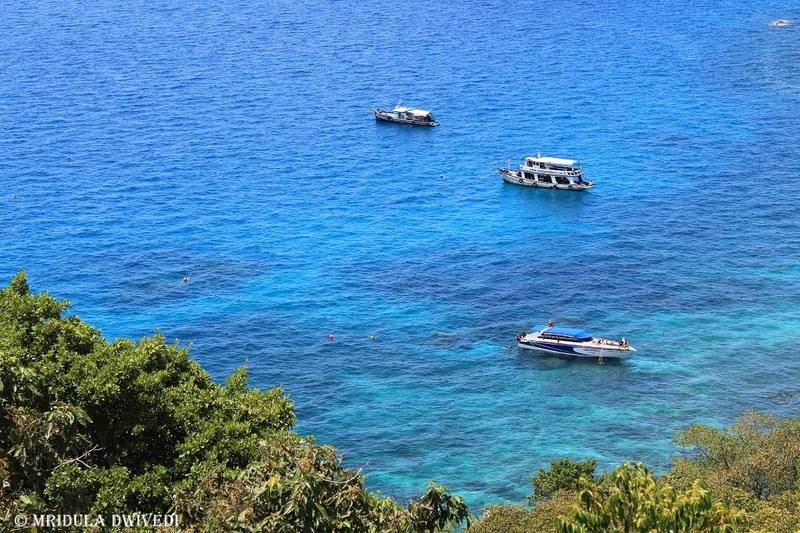 I did a day trip to Koh Nang Yuan from Koh Samui. 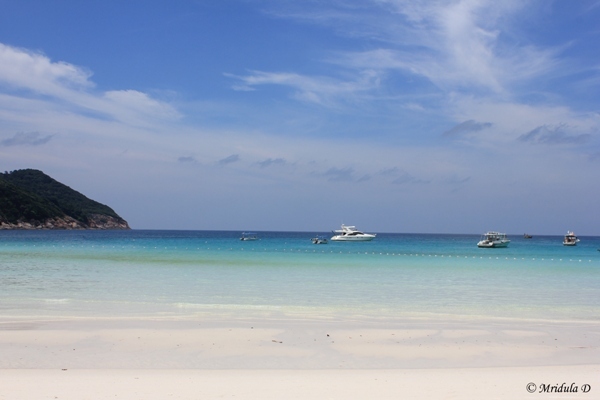 While Koh Samui is beautiful in its own right, Koh Nang Yuan is stunning! 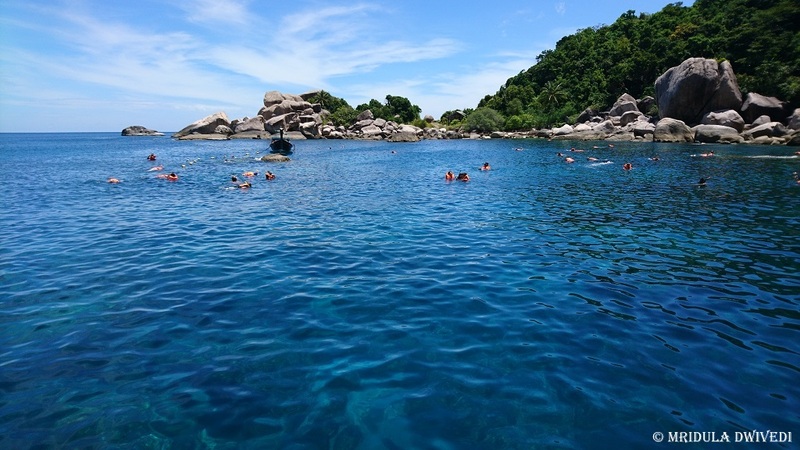 I was under the impression that we were visiting Koh Tao and Koh Nang Yuan but we snorkeled at one spot, which must be in Koh Tao. But we touched land only at Koh Nang Yuan. I am not complaining, I am just stating it as a fact. All the stops were so beautiful, even the jetty at Koh Nang Yuan! 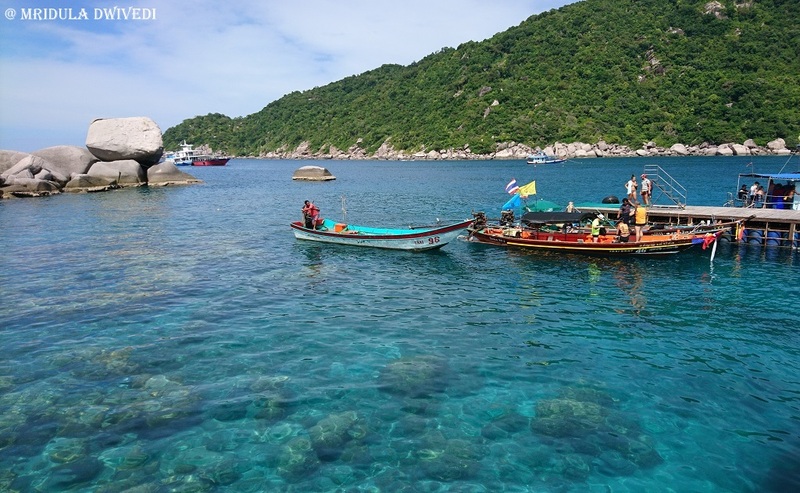 In Thailand, in fact in many other countries too, snorkeling means they will give you the mask, you go and snorkel. If you don’t know how to swim, it is a bit tricky. They do a bit of hand holding for you near the boat if you are a non swimmer. I am lucky I learned swimming when I was in primary school. By now in calm water I snorkel without a life jacket, like at this spot. The spot was rich in coral and fish. However, I am at that stage where I can tell you I saw pretty things, I have no idea what is what when it comes to marine life. After snorkeling we boarded the speed boat again and in a short while we reached Koh Nang Yuan. It was our lunch spot too. The jetty and its surrounding were so impressive that I was reluctant to move. After lunch, our guide told us the direction to the view point and the meeting point. We were to meet again after 2 hours. So, that is all the time I had to explore Nang Yuan. The way to the view point is uphill but well paved. The day I walked up, it was hot. I was sweating within no time. To reach to this spot, the last bit requires a bit of scrambling over boulders. But it was crowded when I went, and people were willing to give you a hand! Speed boats (like mine) come for a day trip and the place gets crowded. However, there is one hotel here and I can only imagine how it will feel once the speed boats are gone! After getting the customary picture done, I took out the zoom lens. And this is what it yielded. 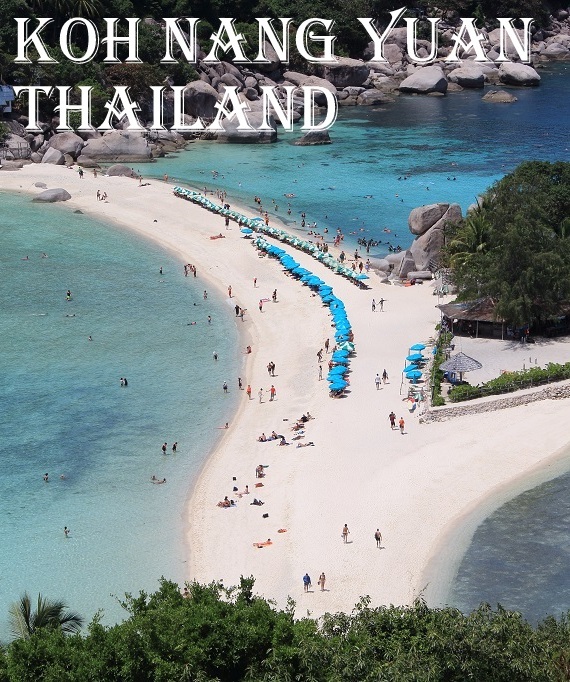 I have been to Thailand so many times, I know there beaches are beautiful but Koh Nang Yuan is the most exotic I have ever been to in Thailand! Here is how the beach looks from above through a zoom lens. It looked inviting for a dip, I was looking forward to get into the water after the hot climb. Going down was easier! And there was water to get into! I had the snorkeling mask still with me. I had my GoPro too. They make for a good combination underwater. This was right off the beach at Koh Nang Yuan! But I was almost at the end of my allocated two hours in the paradise! I certainly wish to back and explore more of the region. 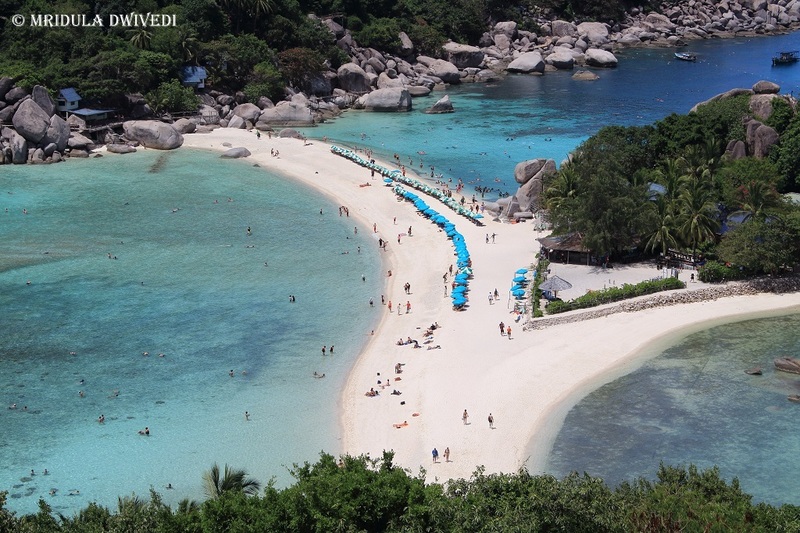 I would like to start at Koh Samui, go to Koh Tao and then to Koh Nang Yuan and then head back home! Let’s see if I can pull it off someday! Till then I will be happy that I at least caught the glimpse of Koh Nang Yuan! While I certainly expected Koh Samui and the surrounding areas to be beautiful, I did not expect it to be this beautiful! How does one even start describing a place like Raja Ampat? Words, and particularly mine, feel so inadequate! Pictures might do some justice but ever since I have come back, I am plotting to go back, either to Raja Ampat or Komodo, which I hear is even more beautiful. However, I refuse to believe that anything can be more beautiful than Raja Ampat. It is difficult to figure out, what captivated me more, the stunning vistas or the people. Raja Ampat is a group of islands in the Indonesia’s West Papua province. It is an amazing diving destination, known over the world for its stunning marine diversity. 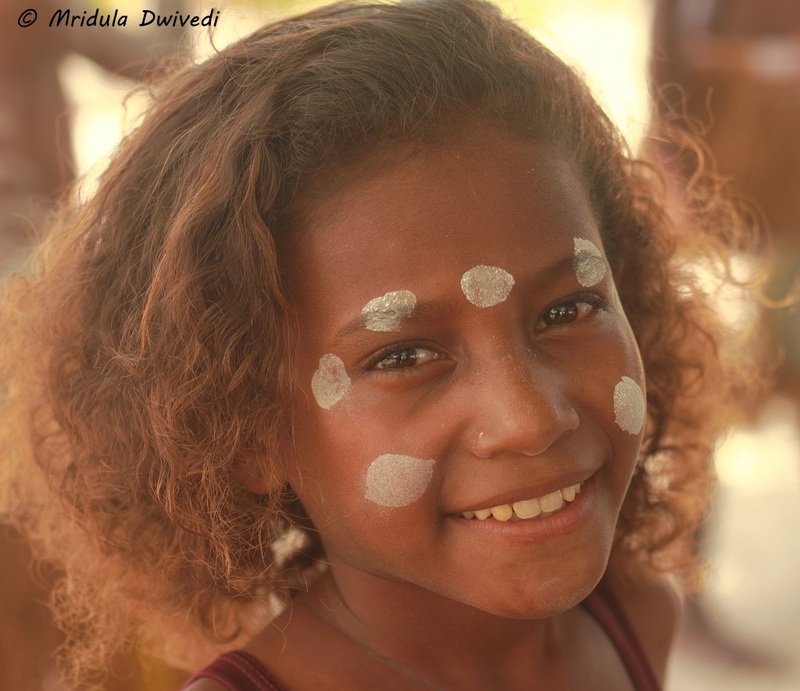 The people of the island villages are gentle and used to visitors. They demonstrate immense grace and dignity, be it adults or children! Most of the kids would not speak English, like the ones I met at the Saundarek Village. But the girls of Sawinggrai were an exception. We landed for the sunset at Sawinggrai, this was my second trip to the village. The girls met me at the jetty. I asked if they spoke English and they confidently said yes! We chatted for a while. They were not learning the language at school. 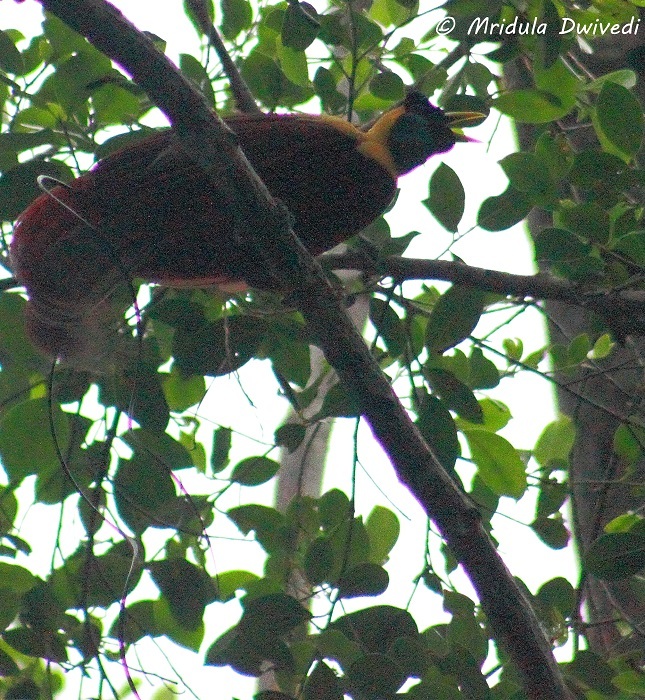 My first trip to Sawinggrai was early in the morning, a day earlier, when we had a date with the Birds of Paradise. I only got a record keeping shot of the bird, but then I saw it with my eyes and heard them make their sweet calls. I am lucky! 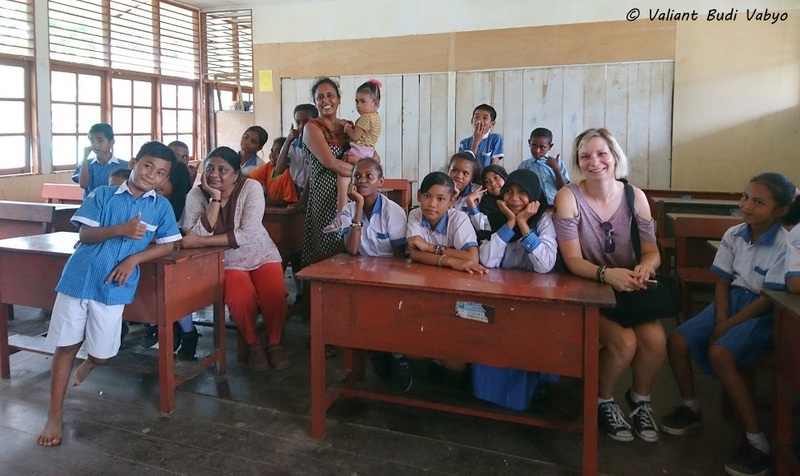 We had the privilege to interact with the children of SDN 2 Waisai School at Raja Ampat. It was because Nila Tanzil has opened her Rainbow Reading Library in the school. She was with us on the trip, a fellow vegetarian! You should have seen the excitement, of both the kids and us while we interacted with each-other. I promise you the library will be a full post in itself but for the moment I leave you with a Indonesian school girl singing a Bollywood song. 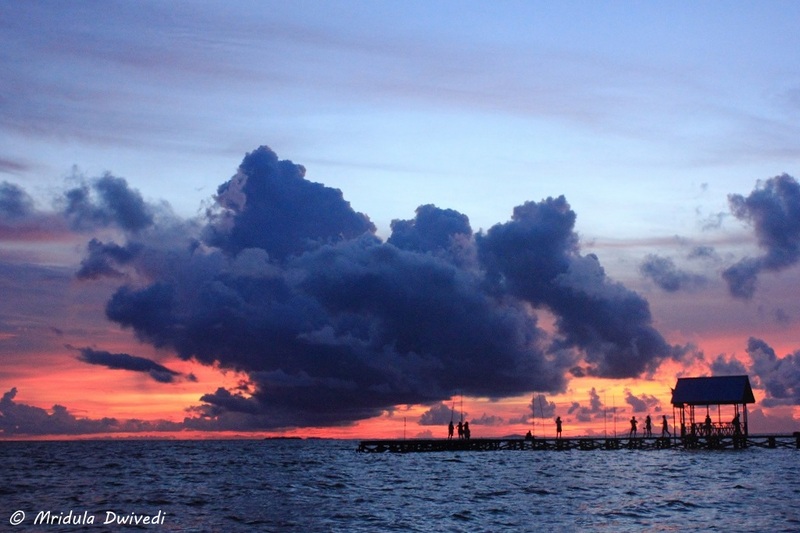 The sunsets at Raja Ampat would like to put on a grand show! Vast open spaces made sure there was drama in the sky! 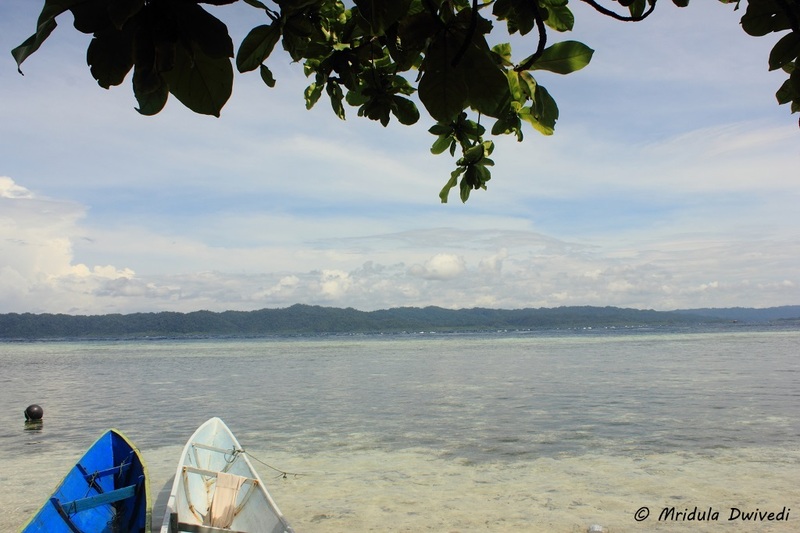 In the end, I left my camera and went into the water, or I would keep clicking the sky till we left for our accommodation at the Raja Ampat Dive Lodge. 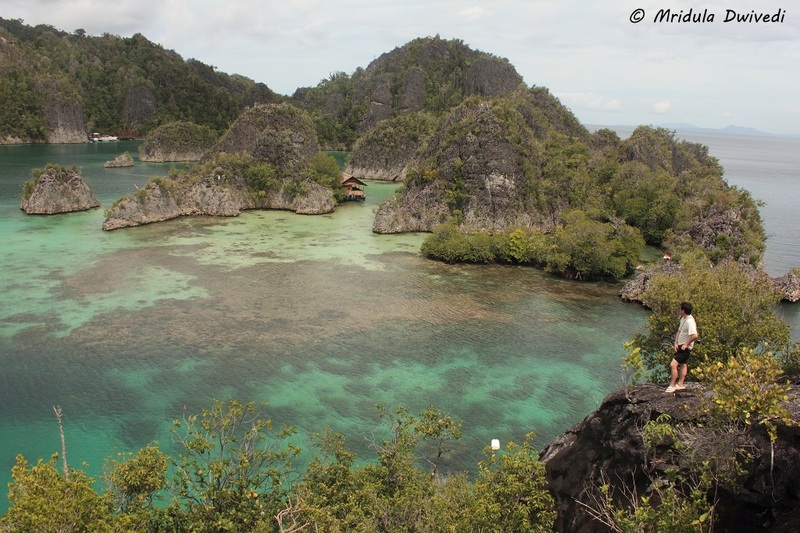 Raja Ampat is know for its diving! 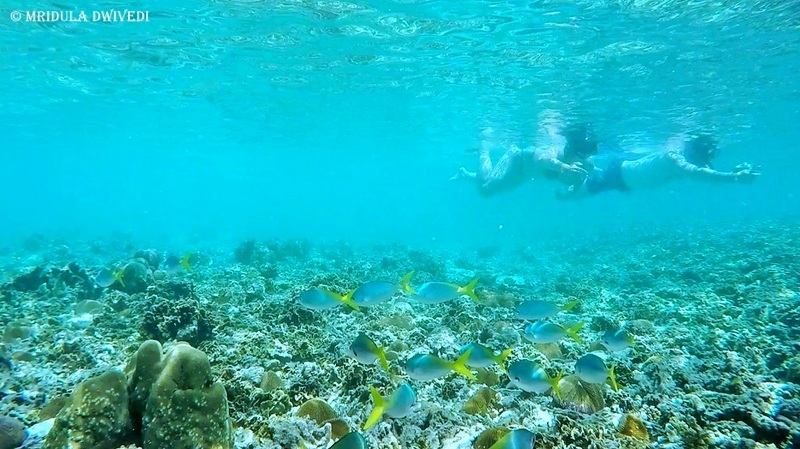 There are plenty of snorkeling opportunities too. 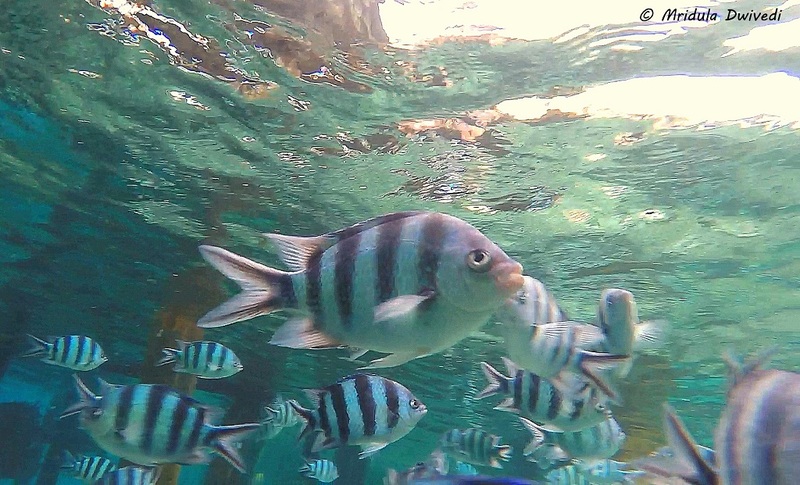 And now that I have a GoPro I can click underwater pictures too. I visited the village of Arborek for half a day, maybe a little less. We were given a grand welcome by the people of the village complete with dance and music. I could not talk much to the kids as they did not speak English but, sign and body language conveyed the warmth, I hope on both the sides! Once again it was difficult to decide what was more amazing, the people or the landscape! Actually both were great and it is such an awesome combination.! 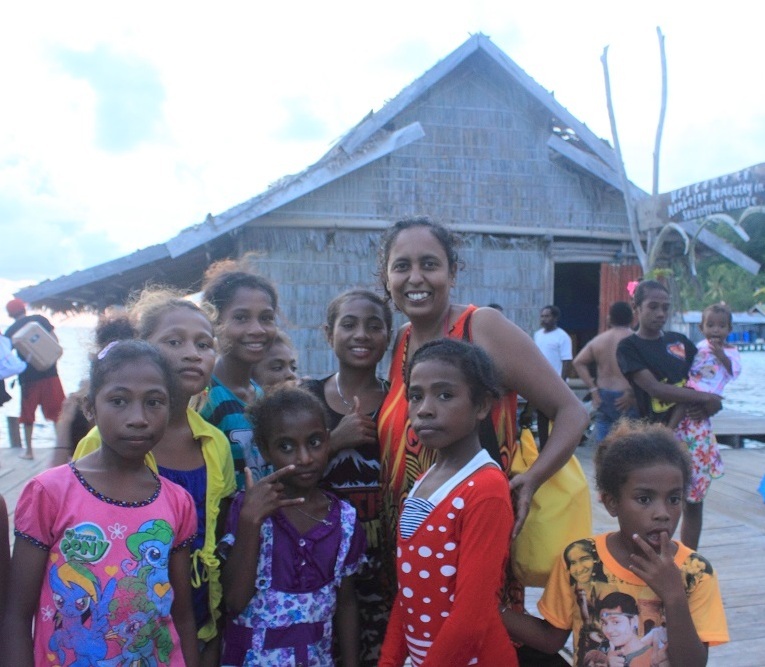 As I was invited by the Ministry of Tourism on the Trip of Wonders to Indonesia I was traveling in a big group. We were an awesome group and our Indonesian bloggers were fabulous hosts. I always got vegetarian food. 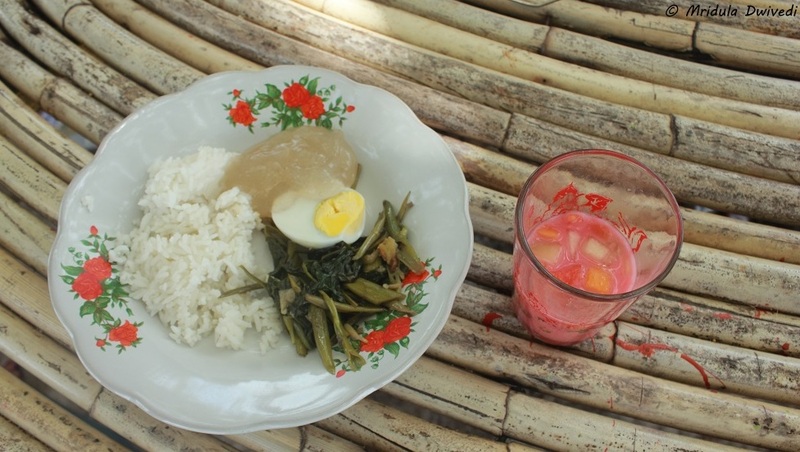 The egg you see on the plate is there because I eat eggs. You will have more choice if you eat seafood and meat but you will have enough as a vegetarian too! I spent only one afternoon at Arborek so I do not understand the significance of the body art. I noticed a church at the village so I know the population at Arborek is largely Christian. The internet was weak at Arborek but it was significantly better at Sawinggrai! You can see, I am plotting to go back already! I had a chat with the fabulous people of @Mountainculturemedia at Arborek. They are from Canada and they came with their kayak! 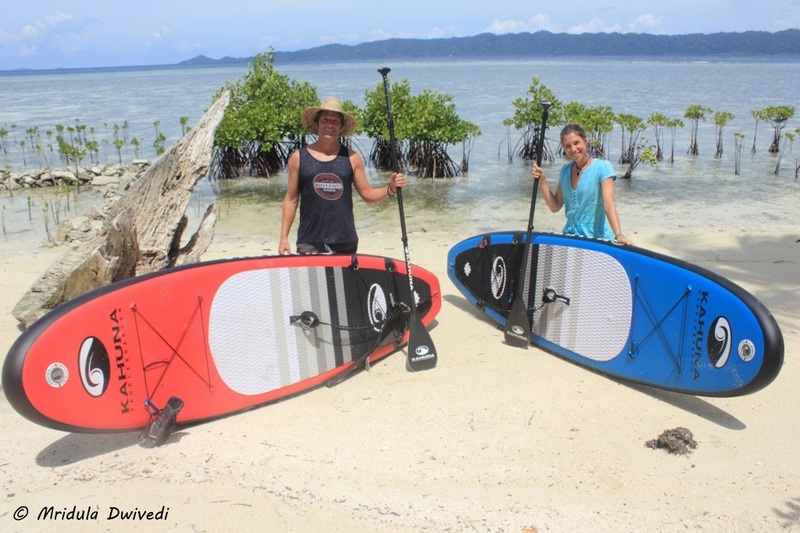 They were kayaking from island to island at Raja Ampat, I sure do envy them! The Boat Would Take Him Far! Who could have thought that a piece of hollowed out wood could be so much fun? 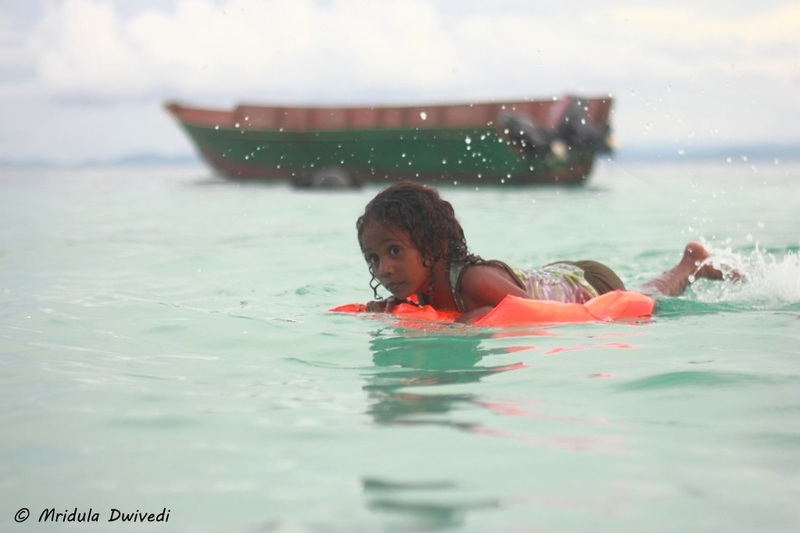 Other kids were playing with thermacol or life jackets but this kid was the king, he had a boat of his own! He would jump in after pushing it hard and then row using his hands! He flipped in the water so many times, but the fun he had! And the fun I had watching him play! 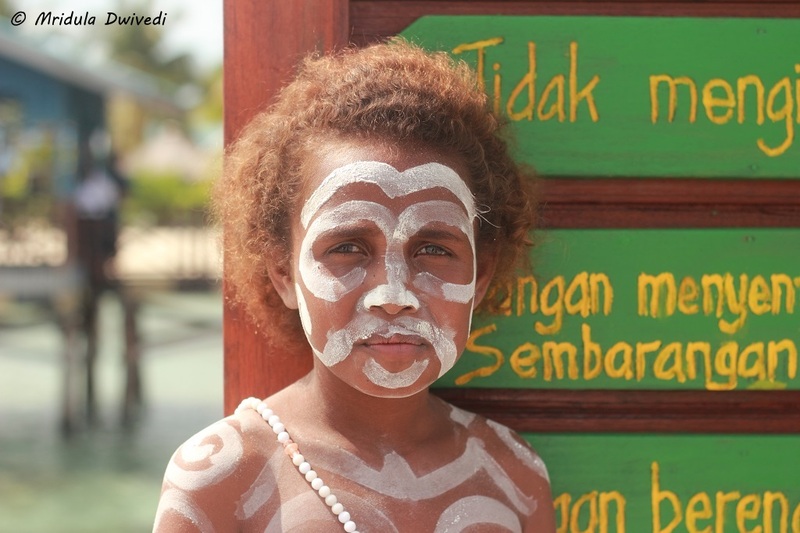 All good things come to an end, so did my trip to Raja Ampat Islands. 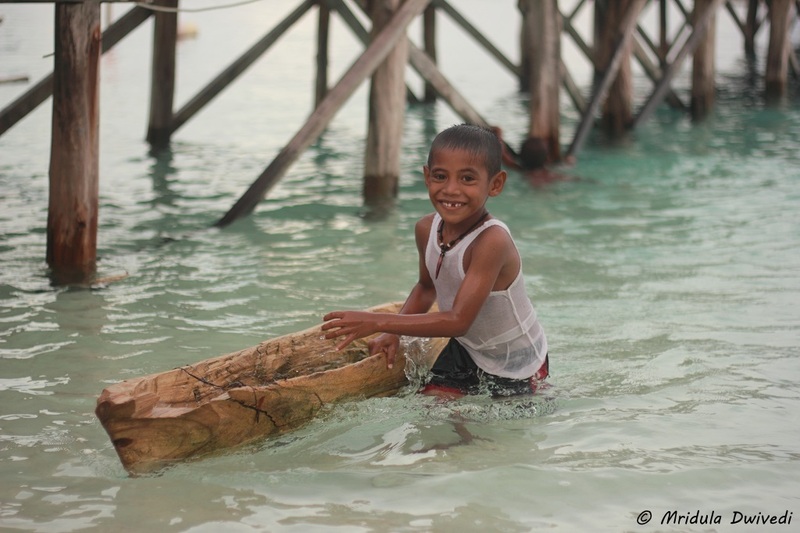 I was heading to Bali next but I somehow knew that Raja Ampat in West Papua was truly special! Raja Ampat was the highlight of my Trip of Wonders to Wonderful Indonesia for which I was invited by the Ministry of Tourism, Indonesia! 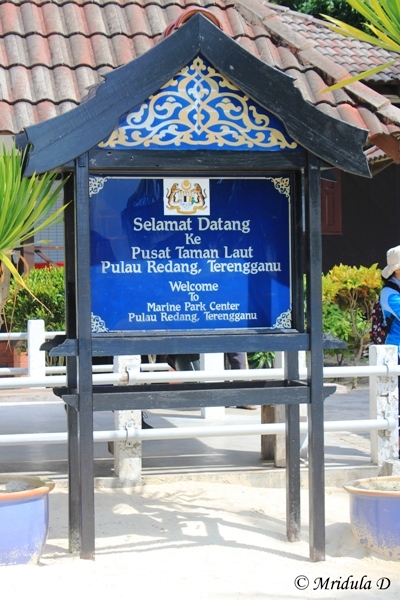 In May 2012 CNNGo included Redang Island (or Pulau Redang as it is known locally) in Malaysia’ top 10 islands. And it entirely lived up to its reputation when I got a chance to visit it in September 2012! When I stepped out to the beach adjacent to my hotel, this was the view that greeted me. It was right in the afternoon and I clicked the picture without much thought as I knew I would be coming back to it in the evening and the light would be better then. I was in a hurry because we were heading to the Marine Park of the island and then we would go snorkeling. So the beach could wait! The lady at the center gave us an excellent presentation about the concept of Marine Parks and the simple dos and don’ts while snorkeling. The first rule was not to step on the corals as they might break (in a flash) whereas they take a long long long time to grow. The second was not to touch any wildlife. The third was not to take any corals away and final one was not to go outside the area marked for snorkeling. All of it made sense. I have snorkeled before but the marine life here was simply out of the movie Avatar! My deepest regret is that I don’t have a casing to take my camera underwater and my words would never be adequate to describe my experience. However, I have to try. This is the exact piece of paradise where I went snorkeling. I collected my snorkeling mask and the life jacket right off the jetty you see above. 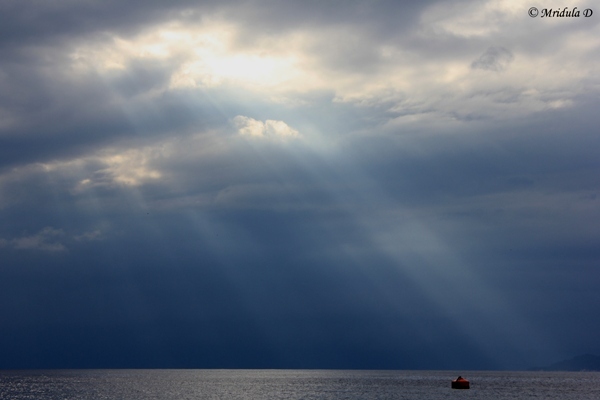 I liked the fact that I was left alone to explore the ocean after donning the life jacket. The safe area to snorkel was quite big and I felt no need to venture beyond it. All the dark patches on water are collections of corals and the light blue patches clear water. I swam for an hour and got out only when I felt I would puke (literally) if I continued any more, I was that greedy. What did I see? I am not an expert on marine life. As I can’t click pictures I can’t even ask friends to identify it for me once I post the pictures online. But what I saw was a riot of colors, red, green, yellow, purple, blue, florescent, grey, black and a cocktail of all this. Sometimes it were the corals and sometimes the fish but what an amazing world is out there under the sea! It has to be seen to be believed. On one particular swim I passed through table corals after table corals and an amazing display of fish. There was a small, really small variety that would roam around in colonies and sting whenever you would pass them. The sting would last only for a fraction of second but I learned to fold my hands quickly when I saw them. Then they would bite me on my face wherever it was exposed outside the mask! But nothing would deter me from exploring save the tiredness and the feeling of nausea in the end! I tried hard to repeat my table coral swim but I could not. But in the quest I discovered other amazing spots! When we finally got out the weather was threatening to storm. 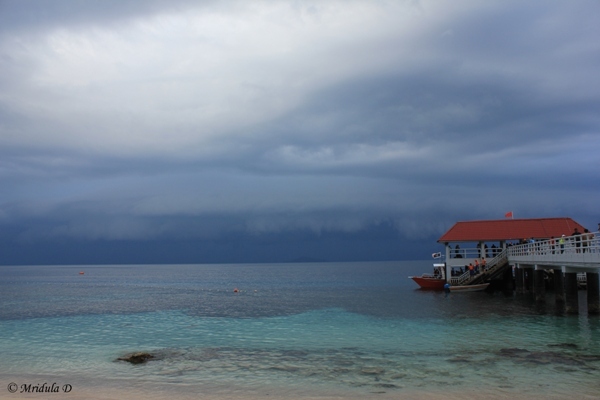 And once we reached the bus stop at the next jetty the skies opened up. With that went the light and plans to click the sunset at the beach! But I was content for the day with the underwater magical world that I was lucky enough to explore and savor. This post is part of Alive is Awesome Bathing Experience for Cinthol.